Hi there friends and fellow crafters. 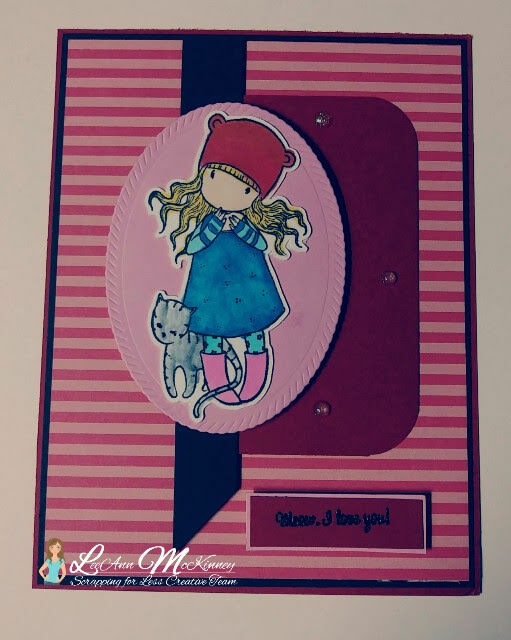 LeeAnn here with a project I made using the August 2018 Flavor of the Month Kit, “All About Pets”. I was so excited when this kit arrived, and could not wait to get started playing. I immediately stamped out the images and put my Scan n Cut to work cutting them out. I used Chameleon Markers to color my images and then went about putting the base together. The sentiment says “Meow, I Love You” which is one of the sentiments in the exclusive Scrapping For Less set. I stamped it with Versafine Onyx Black and heat embossed with Clear embossing powder. Be sure to take a look at Stacy’s post from yesterday and come back tomorrow to see who is up next. Please come join the blog hop this Saturday and get your “All About Pets” Flavor of the Month Kitbefore they sell out. There are limited numbers available.